The early morning mist quickly descended into heavy showers that hung around for three hours making the prospects of lively and high scoring game of football unlikely. However, the prayers of the crowd travelling to MacHale Park, between 8,000 and 9,000 by my reckoning, helped to clear the skies and left a rain-free game that saw Mayo overcome the Yerras by five points. Three goals, 28 points and 18 wides made for a fairly open game, throw into the mix a few hefty thumps and a ref that failed to read up on the new black offence, and you had a spicy enough affair. Mayo had one change to the side announced and that was Jason Doherty coming in for Keane with Higgins reverting to No.4. I wasn’t surprised that a change of some sort was made as Barry John Keane and James O’Donoghue are a handful for the best of defences never mind coming up against a young inexperienced corner back in Brendan Harrison and another in Kevin Keane who is struggling for form. Mayo, playing into the breeze and the sun, won the throw-in and before bums were settled in seats and biros at the ready we had worked the ball via a quick free and quicker hands to Alan Freeman who went straight for goal and finished well. Kealy in the Kerry goal had no chance with the well placed effort. This was just the start we needed as we have been very poor in goal scoring situations so far this year. Freeman’s gander was up and he went on to score 1-5 in a man-of-the-match display that saw two frees and a ‘45 knocked over. The quality of his running off the ball, in diagonal and curved runs, meant that he was always out in front and only twice was beaten to the ball. However, it didn’t really rattle Kerry and they went about slowly pulling back the Mayo lead by controlling midfield and using the wind well to float points over from distance. 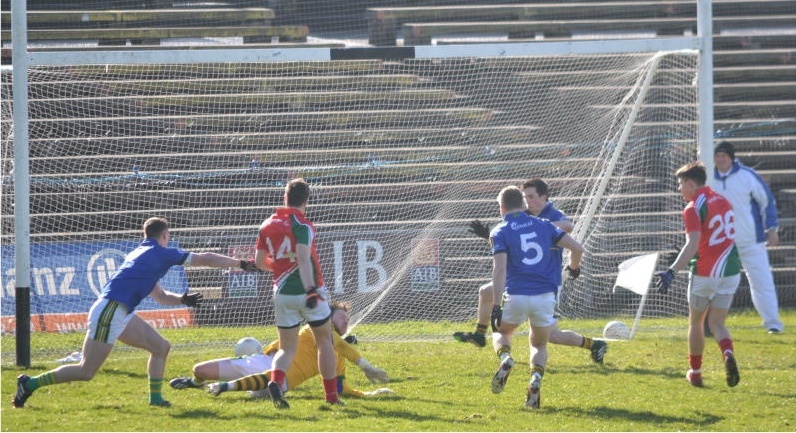 Mayo went ten minutes without scoring, including two missed efforts from Hennelly (a total of four for the day!) and in this time Kerry turned the screw to fire over three points. Kerry were going through the gears nicely and it was interesting to note that the interchange of their forwards and decision-making on the ball were much sharper than Mayo forwards. The Kerry forwards knew what they were going to do with the ball before they got it, whereas we waited until we got it and then had a think about where we would go. Between Kerry kicking wides, points and hitting the cross-bar in the 26th minute it felt like we were running to stand still and with O’Shea and Gibbons soundly beaten on kick-outs from both keepers our defence was under pressure. Kerry created two goal chances coming in off the Mayo left side and we were fortunate that Casey’s effort struck the woodwork and bounced out of play as opposed to bouncing down and in for a Kerry goal. The ref had played advantage and the ball was brought back for a handy Kerry free. The Mayo forwards were certainly working hard and made it very difficult for the Kerry defence to come out with the ball. We turned over possession on a number of occasions, with Freeman and McLoughlin in particular doing well, but the general feeling was we needed half-time more than they did. The half, and indeed the match, was to turn in the last two minutes before the break. Gallagher pointed a free as a result of Kerry grounding the ball from Mayo pressure and then Jason Doherty fired to the net in injury time to put us two points up at half-time. Not really deserved but deserve has nothing to do with it when points are at stake. Both sides created 14 chances in the first half with Mayo scoring 2-7 and Kerry 0-11. The points of note from the first half were just how poor the referee was in allowing a lot of pulling and dragging by the Kerry midfield at O’Shea in particular. 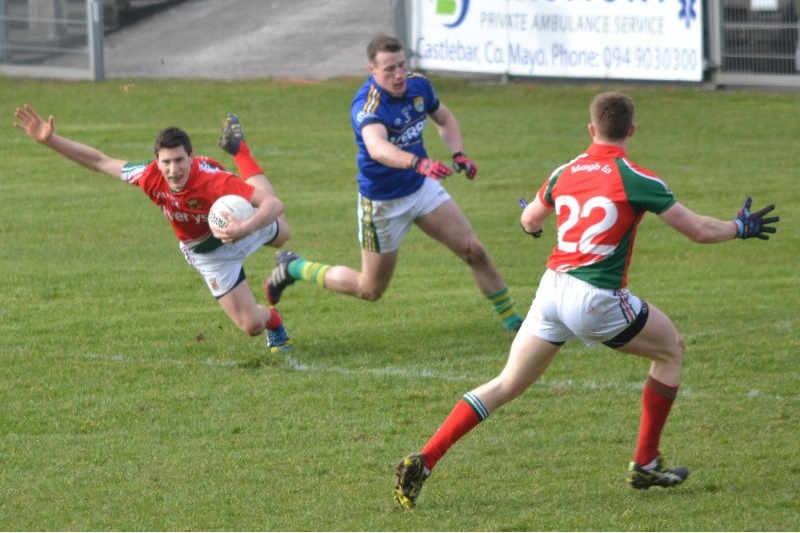 Another point was the searing pace with which the Mayo half-back line ran the ball out of defence. It didn’t always work but when they could break through the halfway line Kerry could not even lay a glove on them. By my reckoning we scored 2-2 from that tactic. Mayo won the throw-in again but it was Kerry that started the brighter. A free inside 30 seconds of the resumption was quickly followed by a brilliantly taken goal. The top corner was beautifully picked out by and almost side footed in by Kerry’s Stephen O’Brien, Hennelly diving to his right but he was never going to get it. Mayo didn’t fetch a clean ball at midfield until four minutes into the second half. Gibbons going up and coming down in possession was a rare sight as Kerry, through breaking ball and clean catches, were in control in that area of the field. The game went through a lull and became scrappy with Kerry quite happy to foul and slow up Mayo when they attempted to take quick frees. They obviously read the ref, Ciaran Brannigan, better than he did the rule book on black offences. Kerry should have had two more gone under the new rule along, with Shane Enright in the 6th minute of the second half, as Mayo were struggling to get any rhythm going. Even a Sonic the Hedgehog type run from Keith Higgins eight minutes in where he sped through the central Kerry defence, side stepping two attempted muggings, before he got his shot off as he approached goal, didn’t get the juices flowing fully. A third tackle coming in got a touch on the shot, but Hennelly remained consistent and kicked the resultant ‘45 wide. Kerry remained a threat going forward but the Mayo defence were getting to grips with them where Cafferkey and Harrison in particular were effective in stemming the Kerry tide. The turning point in the match happened as a result of a Kerry attack 16 minutes into the second half. Kerry scythed through the Mayo defence and Keane fired for goal but Hennelly pulled off an outstanding save diving low to his left where he got a very strong hand to the goal-bound shot. This got the gander up and the crowd reacted to the growing feeling on the pitch that although we were hanging on at times, we were not being punished on the scoreboard. Even though two minutes later Hennelly would complete his perfect day from kicks at goal, four attempts and four wides, his brilliant save swung the momentum towards Mayo. Vaughan and Seamus O’Shea came in for McHale and Gibbons respectively around this time and Mayo slowly began to grasp control of the game from Kerry. Aidan O’Shea, wasteful and ponderous up to now, became more influential at this time and it became almost one-way traffic from the 20 minute mark of the second half. From the 20th to the 26th minute of the second half Freeman scored three points, one from play, and McLoughlin also tapped one over. Kerry kicked three wides on the spin and the crowd sensed that the game was ours to take. This confidence fed to the pitch and Mayo seized their chance. Varley, on earlier for Adam Gallagher who himself had scored two points from frees, kicked a fabulous left-footed point six minutes from time that hung and bent and slowly curved inside Kealy’s right hand post. The game was ours and even the Kerry lady next to me knew it as she had stopped her enthusiastic screeching and was calling for Hennelly to come up and take all our frees, as Freeman had assumed the responsibility by now. However, the best move of the match was to come two minutes from time. Brilliant work by the Mayo defence saw Harrison steam clear with ball in hand and work it through to McLoughlin. He spotted the curved run of Freeman and played a peach of pass that had the Kerry defender the wrong side and too weak to control Freeman. He fouled him, walked on a black card and Freeman tapped over the resultant free. Mayo took eight points from the twelve chances created in the second half and Kerry 1-2 from eight chances. As both sides entered this game pointless it was all about the win. Undoubtedly Kerry needed a win more than us as they head to Omagh next week where nothing is soft up there and we go east to Mullingar where we should have the easier fixture. They played like the hungrier side too and they still have a dangerous attack where Donnchada Walsh worked tirelessly and covered almost every blade of grass on the pitch. However, credit must go the Mayo defence as they restricted Kerry on the scoreboard long enough to allow the lads in front of them to sort things out and get into the game. Credit also to the two Aghamore men, Harrison and Freeman. Today was Harrison’s toughest assignment and he excelled – cool in defence and very composed carrying the ball out at speed. Freeman, though, was today’s pick – beat his man in almost every facet of play and extremely efficient in front of the posts. Onto Mullingar where those two points will be just as important as today’s. Mayo: Robbie Hennelly; Ger Cafferkey, Brendan Harrison, Keith Higgins; Lee Keegan (0-1), Shane McHale, Colm Boyle; Aidan O’Shea, Jason Gibbons; Kevin McLoughlin (0-4, three frees), Andy Moran, Jason Doherty (1-1); Adam Gallagher (0-2, frees), Alan Freeman (1-5, three frees), Michael Conroy (0-1). Subs: Enda Varley (0-1) for Gallagher, Donal Vaughan for McHale, Seamus O’Shea for Gibbons, Cathal Carolan for Conroy, Diarmuid O’Connor for Moran. 2 brilliant today at offloading, it was like top class rugby at some stages the way a mayo man being tackled could find a man , love it , hopefully we get better and better at this. 3 I wouldn’t get carried away as the Kerry replacements were green. 4 I have been saying this since horans first championship game in London. It’s madness bringing hennelly up. Is there no outfield player with a bit of length to his kicks? Well done to all, I though docs goal was the highlight, he can hit the spot and his long range point was great too. Freeman was himself, great to see it. Next week is another 2 points if we show up like today and the rest is 50/50 so we could end up on 6 points. Hope it’s enough. Kerry look like their football is very fluid, maybe it’s just my nerves watching the game or something but they seem to make it look so easy even though they didn’t score for the last 20 or so minutes. It was nice to see Vaughan and seamie back and Kevin being himself too, a lot of positives for us all even though Kerry are a shell of what they were. Freezer oozing confidence today, great first goal, points good and the piece de resistance the long range free – telling Robbie to get lost and nailing it. We lost a lot of breaking ball, but our forwards intensity was very encouraging. Backs again on the back foot a lot. Shane McHale exposed today, particularly for speed. Can see now why we do so well; its all about pace and when you have Donie, Boyler, Keegan and Higgins thundering forward, its a real problem for any opposition. Don’t care if a lot of the action comes from there – keep it coming. Good to see Varley take a great point and Mickey C kept plugging away. Kerry still pretty handy though. O’Donoghue takes a hell of a lot of watching and all the forwards seemed to have great pace. The ‘just-in-time’ offload passes were brilliant……….our guys should keep that skill going. 1-Well i think Freezer deserves the FF position based on that today. He’s a FF that can win a 50/50 ball and score, plus he gets into good positions to cause trouble to any defense. I’ve been calling for his inclusion for a long time, as have others and today he demonstrated why he should be there. 2- We are still vulnerable under a high ball. 3-Lads we need another option at FB. Sorry if that offends ppl, but you can get away with it against lesser teams, but when you play the better teams, you are exposed and it only takes one error. We saw it again today. A FB should own that area. Anyway, delighted with the win. Freezer deserves MOTM but I thought Doc did well too. Delighted with the win, Freezer MOM but the Doc was superb as-well. Weren’t great at midfield lost a lot of breaking ball and Kerry always seemed to have a spare man, this changed later on with the subs. The backs worry me, Kerryman in front of them all day and much faster. Kerry also seemed to be able to kick long range points for fun whereas we, at times seemed to over elaborate. Caught ball watching again and lucky that Kerry didn’t make hay from it. But, a lot more dropping ball for him please. You’d think that today the result was more important than the performance. It was just great to get the win and get some much needed points on the board. That should be a great confidence booster for the remaining matches. I thought Alan Freeman showed great leadership qualities in the last quarter. He really stood up to be counted in that period and helped to drag us over the line. It’s like what he did in the semi-final against Tyrone last year. I thought that the five or six player’s who played for Connacht the last two week-ends were fairly quiet overall. They didn’t get the chance to have any break since Mayo’s last league game. Still Keith Higgins made a few of his trade-mark runs from deep. You could not fault the work rate etc. of the Mayo team, they all worked their socks off. We huffed and puffed until we eventually blew the Kerry house down.Donal Vaughan and Seamus O’Shea helped to steady the ship too. You still feel that we are lacking that touch of class in the final 1/3 of the pitch. Someone to consistently put the ball over the bar, from play, when under pressure. Adam Gallagher was fairly quiet today, I wonder will he be playing next week-end with the U21 game against Roscommon on the following Wednesday night. Of course it should be fixed, but what if it can’t? Lets assume the mayo players are the best we have, what do you propose we do to fix it? Maybe the black card is holding defenders in check? Joe Mc – there are clear rules about how players’ performances may be critiqued on this site, with the key point being that any such criticism references specifics in a game. Saying a Mayo player was “on holidays” amounts to trash-talking and has no place here I’m afraid. Please note for future reference. Massive win today for mayo today Keith is back in his natural position a win against kerry no matter how depleted they may be is always positive …freezer was magnificent today adam Gallagher will be ok he needs more experience at the top level..
We’ll done mayo great match though should the black card be got rid of. kind of ruins the game though The cats are fairly against black cards. True, Couldn’t help think about that as I saw him bang in that goal. David – I keep saying that some type of a sweeper system should help. I know that poses some problems but look at Tyrone and Donegal. Mayo play man to man marking and one slip and the man is gone. We need cover behind, that’s all. A great win, especially against a Kerry team that appeared to want this game badly. Kerry were far more aggressive in the first half, mayo should look at the replay and tackle accordingly, our tackling and marking in the first half bordered on nieve. It improved a lot in the last 20 mins. this is purely a coaching issue, nothing else. positives, as previously mentioned freeman doherty, conroy put his body on the line more than a few times, keegan and higgins. negatives Midfield was cleaned out of it, we did not catch one ball from a kick out in the first half. to be honest that will not cut it come championship. I can see why Horan was trying Tom Parsons. A O Se had a lot of silly turnovers, for such an experienced and good footballer, I am amazed how many times he will carry the ball into multiple defenders, he has to correct that part of his game quickly. Kevin Mac had at least four turnovers and the problem with the new rules and incredible fitness levels is that you just cannot do that anywhere on the field. do not want to be overly critical due to the level of commitment involved, but James Horan has some serious personnel decisions to make before the summer. I am confident he will get it right. Was going to put up a post but joemamas read my mind & got there first. We still got issues at 3,6, 8 & 9 but a win was needed & a win was achieved. Im quiet happy with the result over all.We grounded out a a hard fought and didn’t play to our best and still won. Another reason i was happy was the attacking play overall was a lot better and i really enjoyed watching our lads running at the Kerry backline and lads on their shoulders looking for ball.There was far less over carrying ball and taking ball into tackles .hopefully that will be the trend from now on.I was impressed with how freeman and my own club man Doc took their goals.Before the game i said if we can get good direct ball into freeman he will do some serious damage and that he did.We began to get to grips on midfield in the second half which was crucial.We need to tighten up our backline .Another aspect of the game i like was our forwards putting in a huge effort into trying to stop the Kerry lads going on attack and i think we got 2 scores from turning over the Kerry lads.Massive win for us.Massive!!! Good man Pebbles….just as I saw it. Good win – it was needed. Another two points next weekend could nearly see us stay up as I can’t see either of Westmeath or Kerry take points off many other teams. Thought Freeman, Higgins, Keegan, Boyle were excellent. Conroy, McLaughlin, Doc did well in patches, tried very hard. Liked the look of Brendan Harrison, did well on occasion. Could be an important back up for that position in the summer. Andy looked slow. Got on a lot of ball, kicked some nice passes but still looked to have lost a yard of pace from 2012. Midfield was atrocious and I don’t really rate the two Kerry lads all that highly. Aidan is still carrying the ball into too much contact and is slowing the ball up. 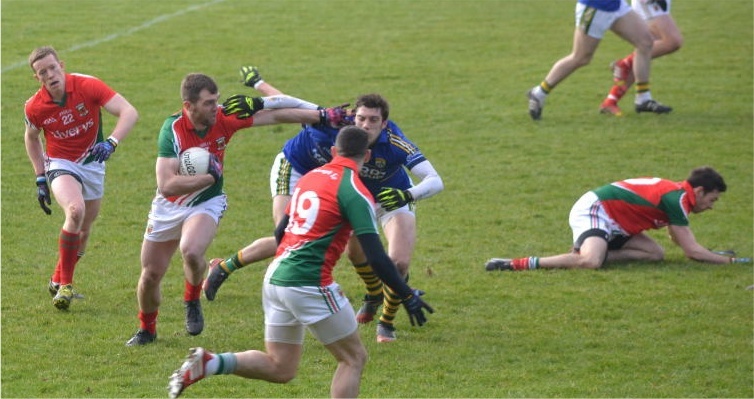 Mayo teams work well when they move the ball quickly – he needs to realise this and stop slowing it down! McHale is out of his depth, in my opinion. Just doesn’t look comfortable at centre back. Gallagher is not a corner forward – far more suited to a wing forward position. Didn’t really happen for him today. Overall, important one to win. The black card thing is nonsense. Referees are so inconsistent with it, it’s getting beyond a joke. The lad who pulled down Conroy deserved to go but how Andy stayed on the pitch under the same rules is beyond me! Anyway, an important one to get the show back on the road but I’d imagine Mssrs. Vaughan, Moran, Dillon and O’Connor will know there are spaces still there for them on that showing. Not sure about that. Freeman clearly had a point to prove today and fair play to him he has layed down a marker. Very impressive stuff however I think he needs to be just as good in next couple of games as well to prove he is capable of claiming that this position is his own. I’m going to wait and see how he plays against Westmeath, Cork and most importantly Dublin in Croke Park before backing him as an automatic choice for FF on this team. Plus it will be interesting after the club final is finished. Barry Moran was very impressive at FF the last day against Dr Crokes. What do the cats know about football? – that the ball is bigger and you don’t have a hurl about sums it up. The black card does not apply in hurling. I gEt the impression that defenders are afraid to foul cause of the black card wonder does it speed up the games or slows them down. Excellent match report. Well done. Happy with the win. Lot to work on though. It also worries me that we don’t seem to be finding many new players. We should win next two games and that will see us safe. Anyone know if David Clarke will be back? Overall a great performance – not perfect by any means but sufficient and decisive for the day. In the first half our defence gave the Kerry forwards too much room. The difference in their tackling since 2013 is remarkable. On the other hand the forwards defended very well, the lead up to a first half Kevin McLoughlin free was a prime example. Freeman was excellent and may be the answer to our problem with long range frees. Certainly Hennelly’s efforts were poor and it seems that his success last week was a case of one [or two or three] swallows not making a summer. It was great to see Donie Vaughan getting into it straight away with a great run just after coming on. When we have all our forces on duty we will be formidable opponents for anybody and with a little luck too good for all. Seems to be a lot of confusion about the black card still. As far as I can see, the referee got the black card calls spot on today. A jersey pull is not a black card. The offence is for a “pull down” to the ground. Andy Moran did NOT get a black card because he did NOT pull his man down to the GROUND, even though he did pull his jersey cynically. The same with the other Mayo jersey pulls today, such as Shane McHales. Mark Griffin for Kerry DID get a black card because he DID pull Alan Freeman to the GROUND. One area Mayo need to smart up on is reading the referee in the first 10 minutes. It was fairly obvious straight away that the ref wasn’t going to whistle for players being fouled when going down to pick up the ball. Ditto pulling, dragging and stopping players jumping at midfield for the kickouts. Kerry twigged this straight away, and continued to benefit from it for large portions of the match. As crazy as it sounds, i think we have a good chance of making the semi’s. we should register wins against westmeath away and derry at home, we also have cork at home and anything could happen there. Dublin dont seem to be fielding as strong a team as they were last year and thats to be expected i suppose. Id love a crack at a semi final in april with more players back and the lads fitness levels improving even further. Great win today, and as already alluded to in previous posts, jh has some answering to do regarding freeman last sept. I still see the delight and amazement on the face of the dub guy i sat beside high up in the davin as freeman was removed. Phew….that was close,it could have gone either way midway through 2nd half,agree with most of the posts already. Kerry really wanted to win this game & only for their bad wides at the end could of snatched at least a draw.Alan Freeman was superb hope he gets left alone in full forward now,also should be taking all frees in Cillians absence, Robbie Hennelly is a very good goal keeper with a great kick out but we should not be relying on him for 45s & other long range frees.Kerry won the midfield battle for 50mins which wasnt expected & it took Donie Vaughan & Seamie to come on to change things for the better.Brendan Harrison had a very good game & looks a real prospect .I would expect us to stay up now with a win against WestMeath & Derry the Cork game will be interesting as will the clash with the Dubs. A few things about today. 1 Two points good. No points bad. 3 On another day all of Hennellys misses could have been points. 4 Hennelly is a very good keeper, although he panicked abit and lacked composure after the brilliant save. 5 Individual runs make for great viewing but too many show weakness and lack of a forward collective thinking. 6 Mayo must stop laping the ball gently into the opponents hands. 7 Lee Keegan makes great players look run of the mill. 8 Pebblesmellers match report was akin to watching a man smelling pebbles. 9 Was James wearing glasses? Just looking at the two goals Tyrone scored in the last couple of minutes against Kildare. Kildare are leading by 5 points and are almost home and dried and let two goals in. The astonishing thing is, for the the first goal the goalmouth was empty; but worse again the goal line had nobody, but nobody, on it for the second goal. Surely common sense would have been to have everybody back. Tyrone would never score 5 points in 2 minutes. Fate is a peculiar thing. They beat Mayo with the last kick and Tyrone beat them with the last kick. How gutted they must be. Micky Harte had a grin from ear to ear!!! The one name no one mentioned was Donnacha Walsh & the amount of ball he picked up was criminal. With Higgins & Boyle back in position we’d hope for less scores conceded but Kerry still rattled up a fair score. Delighted to see Doherty & Freeman back outta exile & surely both should be sharing the free taking & leaving Robbie to shot stopping.Ever since Freeman emerged during the horrendous second coming of J.O’M;he’d be NEARLY the first name on my team sheet.Feed him early & often! Yeah cod, I was wondering about that, what’s the story with Clarke and O’Malley too? About today’s game, at least the goal chances we got, we took them. The lads, the chances fell to, were natural finishers, so low shots to the corners worked well, rather than high blazed finishes. You’d still be a bit worried about the number of goal chances we are giving up, Hennelly made one great save and they hit the crossbar too. So scoring more from play and conceding less goal chances are still high on the agenda, in terms of improvements that we need to make. As you said finding some new players is a must as well. It would be nice to see Sweeney get a run out and you’d prefer to see Adam Gallagher on the half-forward line as well. And that man off course, Evan Regan. It’ll be very interesting to see how the U21 game V Roscommon will go. You have to be fair to the lads who played for Connacht, this is Hennelly, O’Shea, Gibbons, Conroy, Higgins, McLaughlin, . They have played 5 weekends in a row and also doing heavy training. You could see today both midfielders were off pace. We did alright and a win is a win. The last 2 games it was we could/ should have won,and today when we win we still grumble. Let,s see what next Sunday brings and I still think we are good enough to stay in Div 1. Yeah True Grit, I was making that point above, about the lads having played for Connacht and not getting a break the last two week-ends. It’ll be interesting to see who will be selected at midfield for the Westmeath game with Seamus O’Shea back in the reckoning now. Also if Donal Vaughan comes back in at CHB, it’ll be interesting to see what will happen to Shane McHale, will James play him in the full-back line. It would be great to see Cillian get some game time too. It just shows how far we have come in the last few years too, trying to push on and just make those few extra improvements to finally get over the line. That’s what we all want afterall. While on the other hand, Galway are fighting for their lives in Division 2. It just shows, we should really enjoy, where we are at the moment, shooting for the stars, among the elite teams in the land! As you just never know, how things can change in a few short years. Did the long drive from east to west today hit Charlestown and the rain finally stopped and the sun shone – thought it was a good omen for later and so it proved! Happy enough with the performance still plenty of room for improvement. Main gripe was why hennelly was allowed take control of long range frees when it was obvious it wasn’t his day surely a call from the sideline should be made on this and by that I’m not saying the crowd which at one stage roared in unison as he jogged up to take the another free. Most pleasing performance was Freeman’s he looked hungry and composed and that is a great balance for a frontman. Still need to move the ball quicker , it’s proven when we do we are a major force. Next up Westmeath I for one ain’t taking this for granted we need another improved performance to see this one through! Good banter in an sportlan before and after the game. Good to finally put a face to ‘Freespoonwitheverytub’ and ‘Mayo mick’ and Anne – Marie those photos don’t do the colour of your hair any justice !! A great beacon for club 51! Great report, Pebblesmeller, and with Mayo Mick doing the business on the photos too, the meitheal was certainly operating at full tilt today! Today’s win is a real morale booster. As others have said, Kerry really wanted a result today and I thought that in the first half they were moving, passing, tackling and hitting far harder than we were. Some of the hits they put in were fairly shuddering. I felt they’d run out of puff in the second half as a result and maybe they did to some extent, given how quickly they emptied their bench (although the ref had a hand in this too with the two black cards). Alan Freeman was fantastic, from start to finish. His finish for the goal was top class (what a pity he wasn’t at the end of a few of those early moves in the Kildare and Tyrone games), he was the perfect target man and his freetaking was alright too. He proved last summer that he’s the man for full-forward and today’s performance confirmed this. Brendan Harrison, Lee Keegan and Jason Doherty were the others whom I felt really stood out today and Kevin McLoughlin also looked far happier out at wing-forward. It was great too to see Donie and Seamie back in the fray and they both helped to steady things at a vital stage in the second half. It was far from a flawless performance but that’s only to be expected at the start of March. I’ve always felt that this year we need to suspend all judgment on the lads until August Bank Holiday weekend and I still think this is the case. If we win next weekend we’ll be in a great position to secure our Division One place once again and then all the focus can switch to June 8th and (almost certainly) the Rossies, a match that could well, given Galway’s current travails, prove to be the pivotal clash in Connacht this year. Win that one and the road to HQ opens up for us once more. So it’s Mullingar next weekend. If there’s a Club ’51 per-match meet-up for that one, then my vote goes to Canton Casey’s in the centre of town. That was the meeting point for the Vincents/Lomans club match before Christmas and it’s a fine spot, located only a short walk from Cusack Park. 1. He can’t run as fast while soloing, as the movement is awkward. 2. He can’t hold a defender off with his free hand while soloing as his “free hand” is actually holding the ball. 3. The ball is more presentable to the defender as he is holding it in the hand that is closest to the defender instead of furthest away. This is why he tends to get bottled up more and lose possession. I don’t know how this issue wasn’t rectified at some point in his training. Still, he hit a magnificent score today although I do feel that he seems to play better when the team is in front and has “their tails up”. I’m thinking of matches like Laois in 2012 and Galway last year. Overall very important win, delighted for Freeman, thought Keegan and Higgins were also superb. How would people rate Andy’s performance ? On back of the tyrone one.. My thoughts he slowed the play down way to much and missing for long periods throughout and seemly wanted to take all the frees. In fairness he’s not suited as a half forward. Hear hear Nally_Stand!! Especially liked the remark re Robert Hennelly and the crowd. I agree he’s a very good goalie and he should be left do just that ..Goalie!! Missing long range free’s could affect his morale. Mayo looked good but only when they found themselves under the cosh!! Agreed, and to be fair, that was a great point. But all the same, I was not thrilled to see him introduced. I think we should be moving on, trying new options. Was listening to the match on Midwest. Dreadful. The three lads were having a conversation throughout the entire match. You could hear the match going on in the background. Every so often Mike would actually comment on what was happening in real time but nearly all the time, they were talking about what had previously happened. You would hear a roar from the crowd and a few seconds later you would be told what happened, then they would go back to their non stop conversation. Very frustrating. Let one man commentate on what is actually happening and save the analysis until half time. Willie Joe, you’re clearly a mind-reader – I just this minute logged on to ask if anyone here could recommend a good spot in Mullingar. Thanks. Is Canton Casey’s a spot where those travelling could pick up a bowl of soup or a sandwich? Some very interesting observations there Digits. We seem to have a lot of those type of forwards. Very hard working, who can pull off some really top class scores at times, Conroy, Varley and Doherty. You’d just wish that they could be a lot more consistent and be able to get 2 or 3 points from play in every game that they play. That’s what we really need to push on, to the next level, of winning some major silverware. They have the ability to get some great scores, more of them, in every game, would be just what the doctor ordered! Just watching the horrible League Sunday this evening and couldn’t help being struck by the juxtaposition of Padraig Joyce and our own Freezer. Joyce never had great speed nor strength, but was able to make his great talent decisive at the most important moments. What is to stop our own Freezer reaching these impeccable heights? In my mind, it is Joyces incredible self belief that separates them. My belief is that this is the level of Alans talent and what he should be aiming for,today was a glimpse of why this is possible but he needs to be more brave, more willing to accept responsiblility and more consistent over both an individual match and over a season. Self belief, which he showed today in bucketloads, will allow him to step up. Is my mind too frazzled by after game pints, and wishful thinking? What do ye think? Jesus even Mike Finnerty is’nt safe on this site lol. You have a good point tho i beileve it was shocking altogether. Still think the FB position is our biggest problem – unfortunately only have to look back at the two AIF to underline this. We looked wobbly at times but at least we didnt get hit with too mamt high balls into the box. I think it has to be addressed sooner or later and maybe worth looking towards Barrett or Cuniffe to fill this spot. Agree with the comments above regarding sweeper – we have any of 4-5 guys with speed who could fill that role. I think that would make us solid and also allow our HB line to run forward even more. It’s v difficult for the opposition to defend those forward runs from our HB’s. Good workmanlike performance and a valuable 2 points. The wind was pretty strong today and yet the Mayo forwards did not use it well aside from two huge long range kicks from Doc and Varley. Our lack of pace rather than fitness in a few key positions poses some challenges that i hope will be addressed in the remaining league games. Anyhow steady improvement is all that is needed from match to match. Similar effort needed next weekend. I’m not sure how extensive their catering is but they laid on free sandwiches, cocktail sausages and all that for us when Vincents had a pre-match gathering there so it might be no harm to sound them out and see what they say. There’s certainly plenty to discuss after that game but first and foremost it’s a damn nice feeling to leave McHale Park after any win, but particularly after a Kerry win. Good to have those two points in the bag and I will be shocked – nay horrified! – if we don’t take two more this day week. The biggest positive for me was, after seeing Alan Freeman named to start, the defiant, emphatic show he produced. Superb. Why he wasn’t started against Tyrone will forever be a mystery to me (as will The Substitution on Sept 22nd, but we’re looking forward, not back), so it gave me immense satisfaction to see him play with the confidence he did. Down the years, one of his key problems has been consistency (made more difficult by injuries) so I hope he can string together a run of performances like that and claim the jersey for his own. I was surprised to see Doc take Keane’s place but my god, did he put on a show today. Despite Freeman’s performance, Doc got my vote for MOTM and I hope he can go on the replicate that performance. 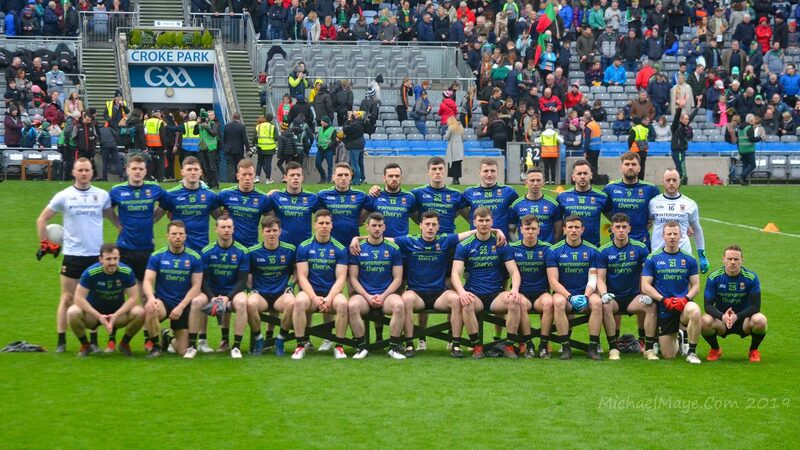 Other positives were seeing Donie and Seamie back in, and the all-round determination we showed in grinding out the win, but we had some luck on our side today and there are still things that need to be fixed. I think Kevin Mc is regaining confidence too and Brendan Harrison looked composed and capable. Gallagher was quieter but popped over two points which we won’t argue with. The main negative for me was the way we constantly overplayed the ball in attack. At half time, some of us were lamenting the lack of ability to convert scores with the same ease as Kerry, but Pebblesmeller put it perfectly above: “The Kerry forwards knew what they were going to do with the ball before they got it, whereas we waited until we got it and then had a think about where we would go.” It was instinctive for them whereas it just doesn’t come as naturally to us. We were punished for that hesitance against Tyrone and we will be again, unless we can get ball in quickly to our FF line who are now suddenly looking a lot more promising. That said, we did, as Roger says above offload intelligently and we had some beautiful runs from the half back line (usually involving Lee or Keith) with very intelligent passages of play – we just weren’t consistent enough in that regard and it’s a difficult, somewhat unreliable way to win games (though wonderful to watch). And it’s hard to get ball into your forwards when your midfield is anonymous as ours was today. On midfield, again I thought Aido should have made way, not Jason Higgins; he looked wrecked and off the pace (somewhat understandable) and he really, really needs to learn to release the ball – this is not rugby! The ref was a bit of a shambles – Kerry and O’Mahony in particular got away with blue murder in the first half. Donncha Walsh was excellent for Kerry though – but he was given too much room. Mayo don’t make it easy or relaxing for supporters, that’s for sure. That game could have gone either way today, and we would only have had ourselves to blame. Our full back line is undeniably a worry and I really hope Barrett returns sooner rather than later. Our half backs will succeed in turning over possession and creating scores from there, but the danger is when the play bypasses them and long ball goes into the opposition forwards – we are too exposed. I know Hennelly had a relatively poor day at the office today in terms of score, but he made an incredible save and is taking ownership of the box more and more – I’d not be dismissing him so quickly. All in all though, I am happy with today despite those concerns – a win is a win after all, and compared to our level of performance this time last year, well, there is no comparison. Even though we are far from the finished article, we are streets ahead in terms of cleverness (think offloading) confidence and cohesiveness, the decisions from the sideline are getting smarter (as others pointed out today, Horan wasn’t on the sideline at all but was clearly in communication with the sideline team) and we look hungry. We needed this win, we got it, and I think there’s a method to the madness behind the scenes. Plenty to look forward to over the next few months. That’ll do – I’ll give them a shout. Keep an eye on your inboxes during the week. 🙂 Cheers WJ! great report mike, I agree with you on the ref. After 10 minutes I checked the program convinced he hailed from the Northern province. 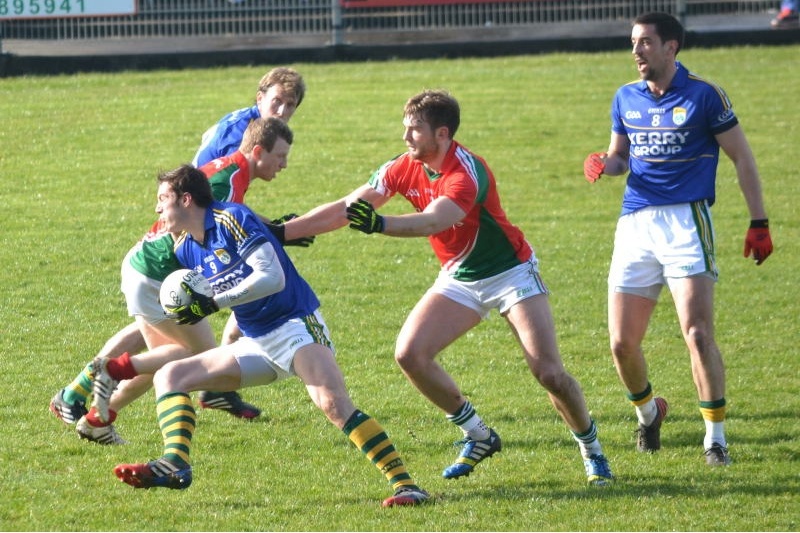 Good match report Pebbles with good pics Mayo Mick to go with it. And just read through many interesting comment on the game. Robbie Hennelly – good keeping, wouldn’t worry about the frees – another player can take those, but he and our backs/midfield are going to have to get much wiser and better with the kick-outs. To much possession is being conceded. Brendan Harrison – didn’t do too bad and will be great cover that JH will not be afraid to call on. Could even grow in to a starter, but currently behind Keith, as well as TC and CB (when there available). Ger Cafferkey – Jez I thought when I saw him hitting hard and horsing his man out of the way going for the ball in the first half, we’re in business, but Caff failed to carry that in to the second half and was lost on more than one occasion. Keith Higgins – I hope this is the end of the experiment in the forwards. He’s the man. Lee Keegan (0-1) – Super game. Shane McHale – His biggest test found him a bit exposed for pace and a little uneasy in possession. The latter will come sort itself with more game but pace makes him more suited to a 3 jersey. And good cover to strengthen the squad. Colm Boyle – Good game. Aidan O’Shea – Had a poor game by his standards. Looked tired and made several bad decisions, taking the ball needlessly in to contact. Jason Gibbons – poor game too – looked tired. Kevin McLoughlin (0-4, three frees) – He’s showing some of his 2012 form but still wasting too many final passes, resulting in turnovers. Andy Moran – No way he has that first 10-15 yards pace back, so Andy needs to pick up more mid-field breaks and more of the playmaker giving other running forwards and over-lapping back quick ball. Needs a couple of more games at 11 to see if it’s working. Jason Doherty (1-1) – Great aggression and hunger – looking good. Needs to be given the maximum game time and he’ll get even better. Adam Gallagher (0-2, frees) – Wasn’t at ease today. Was bullied a bit. Alan Freeman (1-5, three frees) – For God’s sake, leave him at 14. He’s the best option. Michael Conroy (0-1) – you’d feel for Mikey. Enda Varley (0-1) (for Gallagher) – Scored a good point. 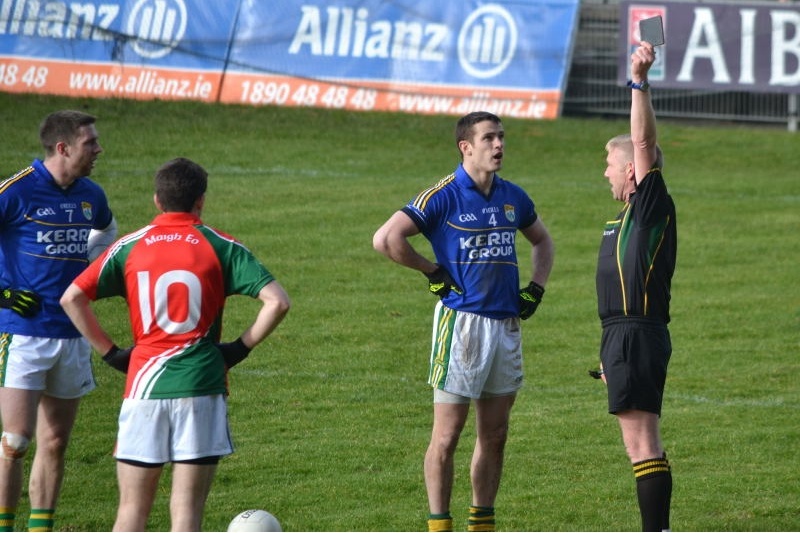 Donal Vaughan (for McHale) – Looked assured and sharp, if not too eager – black cards weren’t about when he last played. Seamus O’Shea (for Gibbons) – Looking fit and he will shake-up midfield – did so in the short time he was on for today. Cathal Carolan (for Conroy) – Worked hard while he was on but I feel that like Keith, he’s an attacking back or a wing forward at a push. Diarmuid O’Connor (for Moran)- Not on long enough to judge on. Who should start against Westmeath next Sunday. I’d go with: Hennelly; Harrison, McHale, Higgins; Keegan (0-1), Vaughan, Boyle; A. O’Shea, Gibbons; McLoughlin, Moran, A. Gallagher, Sweeney (on the bench today after an injury picked up in Croker with Kiltane), Freeman, Doherty. Carolan in to the backs – put the fish back in the water. Caff in to the backs, – I just think he needs to be shaken up a bit. & a run-out for Cillian if he’s ready. One question – anyone got any update on Chris Barrett’s injury status? Maybe I just go them on a bad day but I would have been better ringing someone at the game. It would be nice to unveil a Gooch, Michael Murphy, Bernard Brogan to play in a Mayo jersey. A guy you know that you know would get a goal and couple of points every game etc. But pretty sure there are no guys like this in Mayo at Senior level at moment. I would assume that if they existed we would have seen them performing at club level, where fellas like these really outstanding forwards would be setting up and racking up high scores in every club game week in week out. This happened twice in the game (for Kerry) and should not have been allowed. Certainly Cillian, but Freezer can also deliver game after game, if the right supply is there. And the Doc. has much more to offer Mayo than Conroy or Varley, who don’t worry any opposition defences. Brogan had two good games last year – albeit two very important games. I prefer a balanced hard-working forward line that can all contribute on the score board, rather than the so-called marquee forward. Canton Casey’s is only 50 m or so from the Greville Arms Hotel which is well equipped for a big lunchtime crowd. If Caff was left to operate at full back full time regardless of who is on the square for the opposition it might work better. Instead he seems to be following one particular player no matter where he goes. Today as a result we had Harrison and Higgins on the square at different times and neither, in my opinion. are equipped for the full back position. It seems to be tactics for the opposition to draw Caff away from the square. I agree, I think he showed some leadership and responsibility by signaling to Robbie, as he was galloping up the field, to halt, go back to his line, I’ve got this one! And sure enough, he belted it over. Just grew in confidence as the game went on. Actually, I like the way himself and doc played off each other. At full strength and after some match practice, these two could be a big problem for any defense come summer. Add Cillian to that mix and we could finally have a killer forward line. I’ve great confidence in freezer. Given the chance, he’ll deliver. Andy, I agree but surely Ger and the tacticians must cop on to that! And adjust accordingly. We’ve been caught out too many times in huge games, ala AIF’s. Disappointed with the mob for baying at Hennelly. Not sure if that did his confidence the world of good. Abit more noise in the final 15 minutes of the penultimate game last year might not have gone astray. After the jawing, tea and sarnies, Supporters should support. Yeah Cloud9, Doherty is probably better suited playing as a corner forward. He got a lot of game time in the league last year but mostly playing at full-forward. He missed a few chances against Dublin in last year’s league semi-final. He was taken off at half-time in that match, then didn’t really feature much for the rest of the year. He also got injured too, which didn’t help his chances. He has the ability, no doubt, so it’ll be interesting to see how he gets on for the rest of the year. Nice one Andy – I had the Greville Arms on the list and maybe that’s a better option as I imagine many of those travelling will want to get lunch. Keep you posted. Thanks both. I’ve deleted that comment, Patrick – that was just trash-talking, plain and simple. Please have a read of the house rules (here) on what is and what isn’t okay to say about individual players. Cloud 9 – I’ve edited out two instances in that comment where you’ve stated that certain players “aren’t good enough”. Please see the comments policy, in particular house rule 11 – here – for what’s acceptable and what’s not when critiquing players. The Greville Arms probably makes more sense from a lunch perspective alright. Canton Casey’s definitely beats it for ambience but as the saying goes, you can’t eat the decor! Yeah, you are correct and I got that one wrong. Sloppy journalism. I should be writing for the Irish Independent. Apologies. I agree that Kerry read the ref better than our lads and it resulted in Maher constantly grappling with and holding back O’Shea on kick outs. Ref didn’t blow for this type of foul until mid way through the second half. I was afraid to read any comments until this morning for fear of being the new Eugene McGee !!! Phew… At least one other person saw it as I did. I can’t have been totally wrong so. I think that was the general feeling in the crowd too as you could hear a few groans, especially as he was coming on for Adam Gallagher who is well liked. However, he made use of every ball he got, was out in front of his man and available all the time, scored the point of the game, clipped the outside of the post with another and retained possession and drew a few frees also. But, I think we have seen that type of performance before only for it not be replicated in the whitest of heat in Croker in August/September. In fairness, he cannot do any of those things you mentioned if he is not A) selected to start, B) left on the pitch to play. Thanks Anne Marie. I enjoyed it. Mind you if we had lost the notes might have gone in the fire when I got home! Joe I think half the shouting was from Kerry supporters calling for him to come up and take the frees as, given his record yesterday, they were happy for him to continue doing that. Mayo fans responded. I don’t believe there was anything nasty in it, it was more a case of banter and humour amongst fans. In my book, Hennelly is a keeper first and foremost and his terrific save in the second half turned the game for us. That is where I would judge him. Granted a kick out went over the end line and another went short to a Kerry man, but, his form in the recent past tells us that he is one of the best keepers in the country and yesterdays performance with the boot was a blip, nothing more. A bit unfair to compare him to P Joyce. Joyces record is one of the all time best in Connacht. 3 all stars, 2 All Irelands and 4 County medals in a career that lasted 14 years in the Maroon Jersey. Won a Sigerson too I think in a team alongside Seamus Moynihan. Born in 1977 – and played in first All Ireland at 21 where he scored 1-2 at FF. As he matured though he moved out to 1/2 fw line and became very successful there dictating play. A man i know reckoned that Joyce has been the best fw to come out of Connacht in the past 20 years. It’s hard to disagree with him. Alan Freeman may be good but he has a long way to go to come up to those standards. and anyway his Inter county career is not finished. Best to leave off those judgements until he is retired and then can compare what they have achieved. Carolan has never played in the backs for club nor county. We have such an excess of half backs already that we are trying to convert them into other positions, it doesn’t make sense to move Carolan back there too. When he came on the scene last year he was contributing more to the scoreboard, however, as time has gone on he has become a worker cleaning up breaking ball and tracking runners. He is off form at the moment but is still young and adjusting to this level. Hopefully when he comes out the other side we will have a player who can do both the dirty work and contribute scores. one point on yesterdays game and, once cillian o connor comes back and takes over the free taking duties you will see a savage drop in scores for gallagher and freeman. we need guys who you can RELY on to score 3-4 points from open play when the games are tight against top opposition . We have not discovered anything new from last year in our forwards department to make us better. “went over the end line” !!! Jesus, Rob has a fair kick but hardly that good. I meant side line. Just going through some of yesterdays match figures this morning. Some points of interest I think. The sides were level on 6 occasions in the the first half for a total of 17mins, with the lead exchanging sides 5 times. Despite our good start Kerry were level after 10mins. 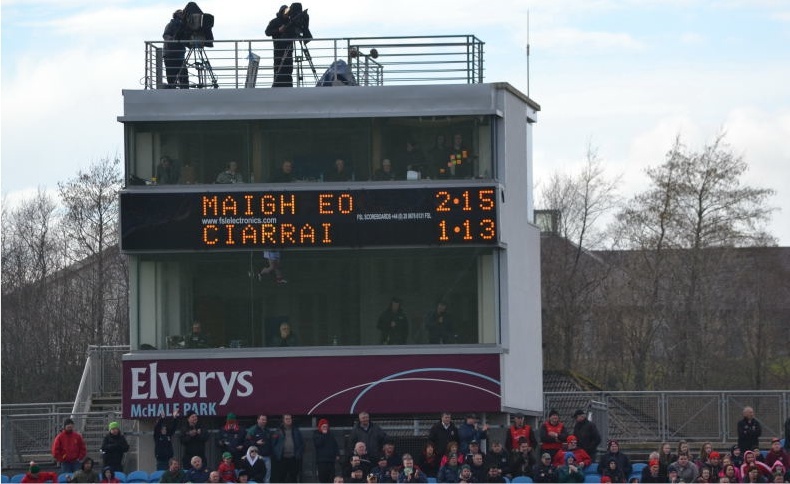 Mayo were scoreless between mins 5 to 15, 17 to 24, and 29 to 35. In the second half the sides were level twice for 9mins and the lead swapped gloves twice. Kerry led from the 38th minute and Mayo didn’t regain the lead until the 57th minute. Kerry didn’t score from the 50th minute, kicking 4 wides and Hennellys brilliant stop. 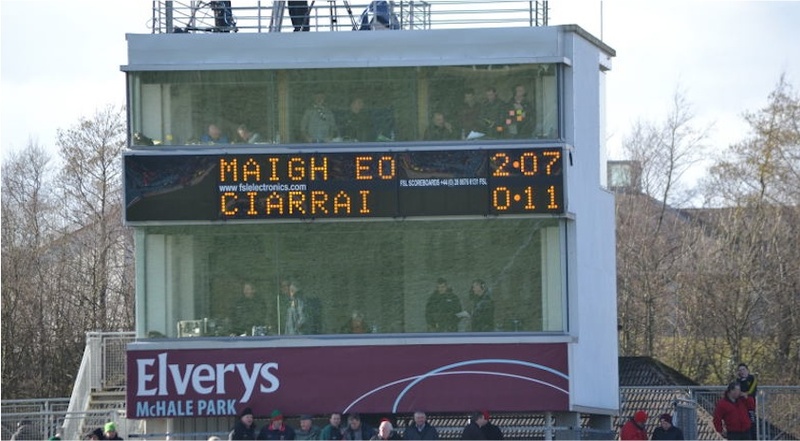 In that time Mayo kicked 6 points and 2 wides. 4 of Mayos last 5 scores came from frees in fairly scoreable positions – poor Kerry discipline or good Mayo approach play??? Mayo were scoreless between mins 42 and 56 and kicked 3 wides in that period. Not one single short kickout yesterday from our goalie, any word on clarke when he will be back? Not completely true, Gallagher had a quiet one yesterday but his two previous games were in the 8/10 type bracket . We all wish we could just find these majestic forwards but that’s not how it happens , if you find one or two gems to blend in with what you’ve already got , you’re doing well and that’s over a period of a couple of years imo. Gallagher , Regan and maybe another or two from last years minors will be sufficient for Mayo to keep challenging for a while yet. Still cant find that rule change? April would be earliest he will be back to full fitness. I don’t know how long it woould take him to get back to full match fitness/sharpness but it would probably be around the end of June so maybe he will be able to challenge Robbie? Citywest – the updated regulations are on the Gaa website here. You need to scroll down below all the card stuff. I think so too Sean. We have no Gooch waiting in the wings, but if we can combine an attacking half-back line, a strong midfield and an intelligent forward unit, then the sum of the parts might just make up for the “standout” forward we’re lacking and leave us with more options to adapt our shape when needed (which we appear to be getting better at doing) No-one ever said we had to do it the conventional way, after all! But the key to that will be playing more direct football with more intelligence than we did for large periods yesterday. Opps, sorry about that Willie Joe. I understand and I promise to find a more charitable way to make my point in that regard in future. I genuinely wasn’t intending to cause any insult to those players, because I know what they go through to wear the jersey. I just wish JH would recognise the limits of some guys after every chance has been given and try others. At that stage, if there are no better players in the county, well then we’re really no better on than last year or the year before, which defeats the plan to achieve he ultimate objective. Apologies again WJ on my rules infringement. Have to agree with dave there, personally cant see young gallagher starting come july/august. This needs to be put to bed now. Mayo didn’t take any short kick-outs yesterday but that was not Hennelly’s fault. If you watch the game you will see minimal movement from team-mates looking for quick/short ones. If his team-mates don’t move, the keeper can’t pass it to them. Also, I believe Hennelly to be a superior keeper to Clarke in nearly all facets of his game. Bear in mind that Gallagher started in the corner yesterday and remained there for his time on the pitch. It’s a completely different game in there compared to the half forward line where you are more involved in the action. He still tacked over 2 points and in the first half he battled with and pirouetted his way between 2 Kerry defenders after a lovely chipped pick-up. It will be interesting to see if he gets the nod in Mullingar or will he be held back for the following Wednesday night in MacHale against Roscommon. Mayo did take one short kick out in the first half. This was only after losing the first 3 kick outs of the game. It was the only short one of the day though. Thats true pebblesmeller he did do a lovely pick up that time, ideally i think they should let him concentrate on the rossie game, i still think darren coen should get more game time. Would like to see him start instead of gallagher in mullingar. I noticed a tactic alot of the teams are doing now, is grabbing the arm of the attacking player and not being pulled up on it. Is this a black card offence? I agree that Robbie didn’t have any options for any short kickouts and it looked like the tactic was to go long to the lads in the middle which was puzzling after the first quarter showed we were struggling against Kerry in the middle third. I don’t think though you can say Robbie is superior in all facets of the game compared to Clarkie. Robbie in my view has a more accurate long kickout ( I would like us to get him to kick to the half forward line wind permitting becouse he is well able to) with Clarke having a better quick short kickout but in terms of shotstopping they are pretty equal as the last two finals show.Clarkie is much more assured at dominating his square especially under the high ball and more assured coming out with the ball under pressure. He is also better at marshalling the three boys in front of him and is a real leader in that bear pit that Robbie hasn’t quite devleoped into yet. Long range frees are a plus in this day and age and Robbie is by far the better option there so for me it’s 50 50 call but I would lean towards a fully fit Clarke (which he isn’t for the moment) purely because of his command of the high ball/small square is better than Hennelly at the moment.Hennelly is the man in possesion so until Clarke proves his fittness I don’t see any weaknesses that Robbie can’t fix that will cost us come the summer and he should continue as our number with the onus on Clarkie to win back the jersey if he can!! Good comments Deel Rovers Return. However, I think Cathal played Mayo’s last two big Senior Championship matches at corner back. Didn’t he come on before half-time for Tom Cunniffe in the semi-final mauling of Donegal in Croker last year. And didn’t he come on again at half-time for TC in the corner in the AIF v Dublin? I agree we have strong backs but if anything happened to our wing backs or corners, I say he’d be at home there. That’s the point I was making. Seanod87, in the last 3 games, how many short kickouts has there been, now compare that to how many stephen cluxton gives. Are you saying that mayo have no tactics in relation to short kickouts? We lost many advantages yesterday due to the slow kickouts, straight down the middle, there was one stage that kerry swamped the midfield and were hoovering up the breaks! Wrong on two counts there, Patrick. It’s not the case that “we can only say nice things about players” here – criticism of all kinds is allowed and is frequently made but it has to be framed in a way that requires a bit of thought as per the house rules on comments. Knee-jerk insults aren’t allowed and claiming an entitlement to do so by terming it your “opinion” doesn’t wash, I’m afraid. That’s okay, Cloud9 – the rest of the post was fine, it’s just that kind of terminology is out of bounds. Thanks for recognising this. Are we ever going to get over that? Freeman wasnt really doing much, he got replaced, his replacement didnt do much either. Maybe Dublin defended well? Stop going on about it. It is done. I wonder will we go a league match this year where the AI final doesnt get mentioned in the comments? In my opinion it was and I’m afraid on this site it’s my opinion that counts so that’s all there is to it. All I’m requiring you to do is follow the same rules as everyone else. And that’s not how to spell definition either! Id agree. Moran slows the game down too much. He seems to solo for the sake of it and then just gives the ball 10 yards – give it the first time. He also has a habit of taking the ball into tight areas, again for no real reason. For my money, if he is going to play then he will have to be at FF. He doesnt have the pace for corner forward and seems to be on a different wavelength to the other half-forwards when he is out there. Maybe freeman at corner forward could be an option, if he is beating FBs in the air he is going to beat most CBs. Let moran come short bringing the FB with him and just loft it in to freeman, and if they cop that and leave moran go then give him the ball. Let’s keep it real, Freeman had a good game and has talent but Padraic Joyce is one of the finest footballers to ever come out of connacht. I’m saying, as is Crete Boom above, that it looked as though the tactics yesterday were to go long with all kick-outs. If the players don’t get into space, the keeper can’t pass it to them. So if Cluxton was going short, that is because his team-mates are looking for short kick-outs. I wouldn’t agree that Clarke is better under the high-ball (he has made his fair share of mistakes under high-balls), but maybe a more vocal leader all right. I think Hennelly has a big advantage with both long and short accurate kick-outs (his technique is a lot better than Clarke’s), and he is a lighter on his feet meaning he tends to be able to get the kick-outs away quickly too. Well we will have to agree to dissagree on the two lads ability but I think from both our agruments put forward it is plainto see there is not much between them even allowing for our own personal preferences. I do think you are to something seanod about the movement of our players for the short kickouts which going by what I have seen in the flesh from the first three league games it is not up to standard. The first half semi final of 2012 stands out for me where we used the quick short kickout well to control the tempo of the game. I though we could have used a combination of Andy and Adam Gallagher along with Keegan , Keith and Boyler to keep the kerrymen guessing but we didn’t seem to even hint at it. It is a pretty simple thing to rectify and we have done it before so hopefully management will be on top of this. I certainly wouldn’t lay all the blame of the keeper for this.If the option is not there he can’t take it no matter who is between the posts!! 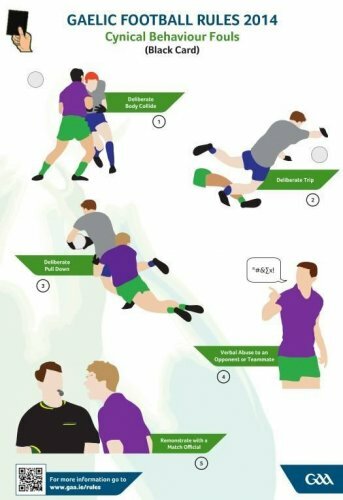 Mayomanindublin – The black card offences are here in the pictures. It’s not a black card offence to grab someones arm or jersey. It is an offence to pull them down to the ground – the important words being pull and down. Cloud9, these were the two instances when Keith Higgins was moved back to corner-back, from the half-forward line and Carolan came on then in the half-forward line where Keith had been playing. It happened in the Tyrone game as well. I sometimes think we put too much emphasis on the last game played rather than observing form over a number of games. So today there is a tendency to say Hennelly should not take long range frees just because he missed a few yesterday. Remember he nailed a few for Connacht last sunday. Remember we have struggled with long range frees for years. True Cillian got a few v Dubs in 2012 semi final but he is not a really prolific kicker from distance so Id give Hennelly more opportunities.Also McHale has got a bit of criticism for yesterday but judge him over a longer period. Likewise Doc was impressive yesterday but he has had days when little went right while Freeman did not have a great championship in 2012 or 2011. My point is that we shouldn’t be too quick to criticise or over praise based on one match. I am sure they all give their best and sometimes things just don’t always work out. True HSE, your right (again). You could say it’s never the last game that matters, it’s always the next one. And your right, it’s smart to base opinions over a number of games. Andy, take your point on caf being dragged around,but think a sweeper may help, especially when it comes to AIF time. Would make us a bit harder to break down. I have been going on about this for a long time and more so since the AIF last September. Cluxton is the master of putting a ball in to a space that he knows a Dublin back is going to go in to. seanod87 is totally correct – there appears to be no work being done by the Mayo coaching team on getting the ratio of winning primary possession up. There seems to be no work being done on practice plans to have space grids that the keeper puts the ball in to, and a back knows where the ball is going so he has a 3 yards start before the forward marker realises. It’s not rocket science but it demands practice and it’s worth it to gain maximum primary possession. And a football team the respects possession as sacred, has a serious advantage. And not just with kick-outs, but frees, better and safer passing (less turn-overs), and higher scoring ratios. If we have the ball, the opposition don’t, and the rest is about getting more scores from the additional ball. So Hennelly or Clarke – it doesn’t matter as long they’re the form goalkeeper at the time and the kick-outs are down to the system! Very important point there. We have to form opinions over a run of several games. Long range frees are a huge part of the modern game (think Cluxton for Dublin). You need to be nailing at least 50% of those in the big games. Just because you have a blip in one game does not mean you abandon the idea. After all the long range frees are by definition difficult. I would go so far as to say that a GOALKEEPER’S KICKING PROWESS is now the second most important factor in modern day football. The most important factor remains the prevention & taking of GOAL CHANCES. Yesterday we scored two & conceded one … we won the game. In the AIF we scored one & conceded two … we lost the game. Do the maths. Ask Kildare about the value of goals after their nightmare end-game yesterday ! Yesterday we had Freeman & Doherty take their goal chances expertly .. I believe this won us the game. More of the same will make us difficult to beat … together with a tightening up at the back that would result in the concession of fewer goal chances. Not many teams will beat us if we stop conceding goals. Cloud9, it’s not as simple as that. Yes, by playing your own kick outs short to a predetermined system and a back running free is all good and well, and it will almost 100% result in you have possession of the ball. But, there are 2 things that somewhat negate this tactic. 1. You have possession in the wrong area of the field and face into having to retain the ball through 10 to 13 phases of play thereby slowing the movement of the ball down, allowing your opponents defense to get back in position and numbers to close down space for your attack. Also, it increases the possibility of misplace passes from your team. 2. If the opposition forwards turn over ball from your defense while playing short kick outs from the back, stats show that there is an 85% success rate of scores from turned over ball in that area of the field. I believe it is not a case of one or the other, but more a case of each tactic whenever it suits. Horses for courses. A bit of unpredictability in the tactics will keep your opponents guessing. That’s an important distinction, it appears – thanks for highlighting it Digits. Pebbles, fair comments but I wasn’t suggesting we use it all the time. Cluxton keeps opposition forwards and midfield guessing and 9 pot of 10 times plays the best option. And the tactic was the major contributor to Dublin winning the AIF last year, yet we appear to ignore it. Fail to prepare – prepare to fail. We had the best team last year for breaking out of defence with the ball, we just didn’t always have the forward to polish it off, which JH is hopefully slowly coming to grips with. Yet, we ignore this tactic that Dublin used successfully. We have great fielding midfielders but not the most mobile, but out backs are seriously mobile. Play to our strengths by using all the options – be it Hennelly or Clarke. I agree that turnovers are very dangerous but not much more than loosing a lot of our own kick-outs. I agree. And it was the same tactic that beat us in the league semi-final too. They targetted Aidan O’Sheas midfield ,arker and pinged balls out to him as he peeled away from the centre midfield area. All of the top counties have a long range free taker now. these are guys who can put a dead ball over the bar from outside the 50 without the wind at their back and also into a stiff enough breeze. It was noticeable watching the match on Saturday night and listening to Paul Earlys commentary. He highlighted the fact that the very good long range free takers have the power to hit the ball with backspin, thus making its flight go a lot straighter the whole time. This helps the accuracy considerably especially on windy days. But it takes a lot of control and power in the boot and leg to do this. The only one who has this power for us is Hennelly. I think it’s simply too far for O’Connor or Freeman to kick consistently as they don’t have the power in the shot when it is taken off the ground to get the backspin. This then ultimately lowers the % accuracy.